Robert Budreau’s “Stockholm” opens with the words “Based on an absurd but true story,” and then what follows isn’t really that absurd and maybe not that true. Budreau takes a very unusual approach to the hostage thriller by making a movie that’s not really that thrilling. This is no “Dog Day Afternoon,” but more of a character study of a quirky loose cannon who was just charming enough that the crime he chose to commit ended up changing not only the understanding of the hostage-criminal dynamic but the modern vernacular. Everyone knows what “Stockholm Syndrome” is and Budreau’s film offers a heavily fictionalized version of the hostage crisis which gave it a name. The smartest decision Budreau made at any point during production was to call his former collaborator on “Born to Be Blue,” Ethan Hawke, who keeps this sometimes frustrating film nimble and entertaining. 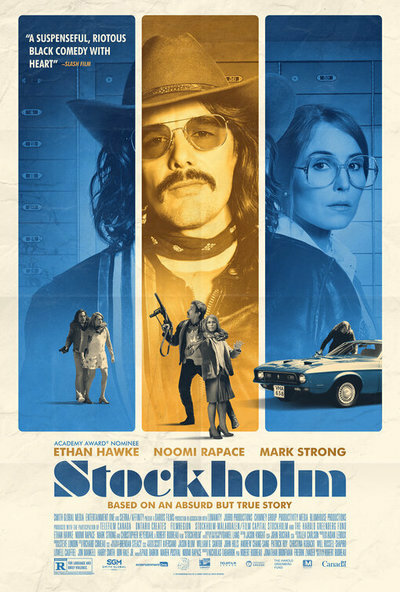 Of course, the action of the film takes place in Stockholm in 1973 when a hapless criminal named Lars (Hawke) marches into a bank and starts making demands at gunpoint. He takes a few employees hostage, including Bianca Lind (Noomi Rapace), with whom he forms a connection. Lars doesn’t want money as much he wants an old ally named Gunnar Sorensson (Mark Strong) released from prison. The cops, led by the defiant Chief Mattsson (Christopher Heyerdahl), bring Gunnar to the bank, but then everything reaches a stalemate when Lars insists that they be allowed to leave with their hostages. The Chief won’t allow that. Divisions start to form and the plan starts to break down when Lars and Gunnar realize they’ll have to kill a hostage to prove they mean business. We all know that “Stockholm Syndrome” refers to the dynamic in which a captive starts to side with their kidnapper more than her rescuer. How that develops is a fascinating psychological dynamic that the movie “Stockholm” isn’t really deep enough to examine or interested in doing so. Without the hook to the event that gave the syndrome its name, this would be just another quirky movie about a likable criminal and the woman who ended up falling for him. In fact, the film falters most when one considers how it compares to the actual event, particularly in how it fictionalizes a lot of what really happened and yet still doesn’t really offer an insight into the phenomenon of Stockholm Syndrome. A reason that “Stockholm” falters as history or commentary is that Budreau stays completely tied to the bank robbery itself. In the real case, the syndrome became a story when the hostages refused to testify against the criminals, and the two main players in the stories, whose names have been changed here, actually became friends (and there were rumors they became more than that in the bank). How someone goes from a violent attacker threatening to kill you to one of your family friends is fascinating, but Budreau sticks to a single-setting piece instead of the arguably more interesting events that followed. However, once you realize that there are better films about Stockholm Syndrome than the one that’s about the crime that gave it a name, “Stockholm” is not without its charms. As he has so many times in his career, Hawke finds angles into a character that other performers wouldn’t have considered. His take on Lars is quirky without ever being abrasive. He makes people sing Bob Dylan and he’s prone to emotional outbursts, but there’s something fascinating about him. Hawke never succumbs to the trope of the charismatic criminal, making Lars more interesting and genuine than other actors possibly could have. And Rapace has been wasted in a lot of material lately but is genuinely good here, often best in her quiet moments of fascination with Lars that don’t oversell this as a love story. It’s a bit tonally inconsistent and ultimately doesn’t add up to much – it kind of slips through your fingers the minute it’s over – but “Stockholm” is just light on its feet enough to keep you entertained while you’re watching it. It’s better appreciated as escapism than history, but you may be surprised how much you end up defending it too.